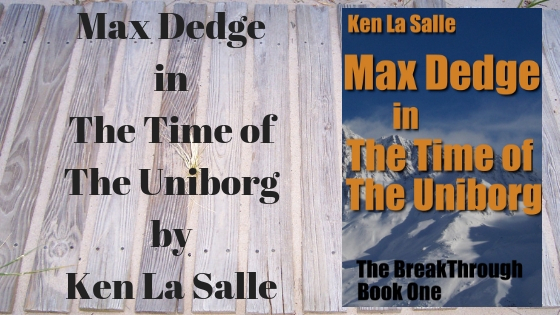 Ken La Salle is a prolific writer, penning stories in several genres, and I have enjoyed a few of them, so to add Max Dedge to the list was a no brainer. Want to take a ride with me…to a distant land? Hop on board. When I first met Max, he was, literally, up a tree. What was he doing up there you may ask. Well, he’s a private detective and he is detecting some infidelity. A couple of things happen to him while he’s up there, but the main thing is the phone call from Edward Cazwell. He wants to hire him. Max Dedge is getting divorced, but he talks to his wife frequently. She tells him he is in over his head, when Edward Cazwell hires him to find out who is exploding bombs in San Francisco. There have been three…so far. But they are a bigger mystery than you may think, stranger in more ways than one. Max always has his trusty Velocity 3200, Sylvester, at his side, and an ear bud to make life easier. Sylvester is a cell phone.Too bad Sylvester doesn’t have hands and feet, though often Max forgets that he doesn’t. Max, more or less, falls into adventure. His investigation has taken a dangerous yet very interesting turn. As I head down the rabbit hole with him, we visit strange places with strange and interesting people. He bumbles around and puts his life on the line more than once to get the answers he seeks. While in this strange world, he picks up another helper. One that seems to have claimed him as his owner. The ‘squeaker’ shows him a library and in that library is a Uniborg. It looks something like a unicorn. What does this mean? Ken La Salle manages to add humor to his writing, making the dire and dangerous situations Max gets into a bit comical. Wow. This was one wild ride, through hidden gateways to a world of magic and intrigue. The world building was creatively developed, filled with wizards and lands that made it seem as if Max had stepped back in time. Even the peripheral characters have a part in Max’s story, each important in their own way, whether helping or hindering his investigation. Ken La Salle has a fantastic imagination that takes me places I could never dream of myself, and I loved this fantasy adventure into an alien land, while traveling around the world and back again. I voluntarily reviewed a free copy of Max Dedge by Ken La Salle.